People from all walks of life are re-discovering the joy that comes with maintaining their homes. It’s one of the simple pleasures of life. However, it can become a challenge to figure out the most urgent renovation project that you should undertake as a homeowner. If a renovation project is simple and can be tackled over a weekend, you can consider it as a DIY job. And, leave the complex ones in the hands of a professional. A problem area for many homes across Toronto and Greater Toronto Area is the exterior areas surrounding the foundation. It gets walked over all the time. Eventually, the constant wear and tear can start to crack & crumble and may cause tripping hazards. When it comes to a damaged walkway, don’t let it become more of a problem for your home. A concrete walkway is essentially an extension of your home. It is a path that friends and family will travel to get to your home entrance. You want your home to stand out from the rest of the neighborhood. Hire Pour Concrete, a skilled professional and experienced concrete contractor, who will take care of it. Our team of skilled professionals will assess, diagnose and find the best possible solution to remedy the situation. If the walkway damage is superficial, as is often the case, we will restore it and upgrade the appearance rather than demolishing it. If there is a need of demolishing the current one, trust the expert to work magic. As a team, we will utilize our skills in building a concrete walkway that will take the pounding from frequent traffic and withstand the weather elements as well. Pour Concrete, which proudly services Toronto and Greater Toronto Area, is your solution to creating a new concrete walkway for your home or business. In the process, we will ensure you have the curb appeal that has been lacking for a long time. 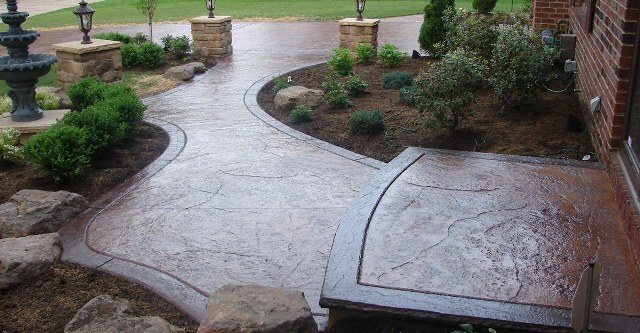 Pour Concrete suggests you to avoid putting a sealer on the walkway. Applying a sealer too early can have adverse effects on the concrete. If you apply the sealer early, the water will penetrate the concrete walkway and the sealer will lose its purpose. So relax, wait for the concrete to fully cure. Part of our job process is to return to each customer’s home to ensure that they are completely satisfied. Usually about a season later, Pour Concrete will return to your home, apply the sealer, and in the process protect your investment too.